← New 3-D Image …of Jesus? 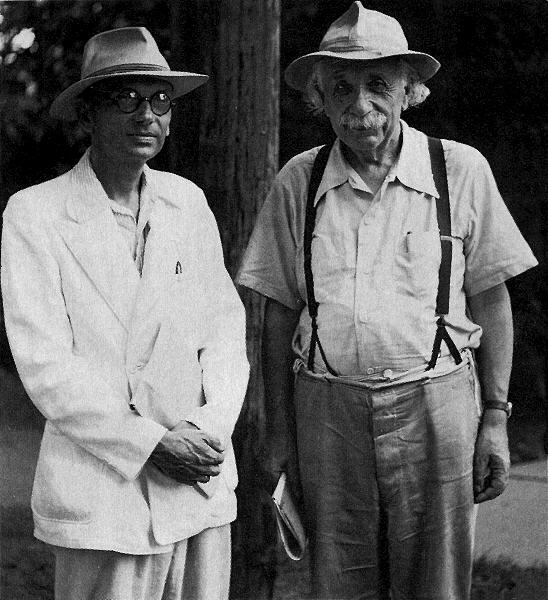 Below is a photo the late mathematical genius Kurt Gödel (left) with Albert Einstein. Gödel’s Incompleteness Theorem was the most important mathematical theorem in the twentieth century (its significance is explained in simple terms below). Among other things, Gödel’s theorem proves no “Theory of Everything” in physics can ever achieve the status of cetainty (this was only recently recognized by Stephen Hawking, as explained by Physicist and Philosopher of Science Stanley Jaki here. “In 1931, the Czech-born mathematician Kurt Gödel demonstrated that within any given branch of mathematics, there would always be some propositions that couldn’t be proven either true or false using the rules and axioms… of that mathematical branch itself. You might be able to prove every conceivable statement about numbers within a system by going outside the system in order to come up with new rules and axioms, but by doing so you’ll only create a larger system with its own unprovable statements. The implication is that all logical system of any complexity are, by definition, incomplete; each of them contains, at any given time, more true statements than it can possibly prove according to its own defining set of rules. 1. Someone introduces Gödel to a UTM, a machine that is supposed to be a Universal Truth Machine, capable of correctly answering any question at all. 2. Gödel asks for the program and the circuit design of the UTM. The program may be complicated, but it can only be finitely long. Call the program P(UTM) for Program of the Universal Truth Machine. 4. Now Gödel laughs his high laugh and asks UTM whether G is true or not. 5. If UTM says G is true, then “UTM will never say G is true” is false. If “UTM will never say G is true” is false, then G is false (since G = “UTM will never say G is true”). So if UTM says G is true, then G is in fact false, and UTM has made a false statement. So UTM will never say that G is true, since UTM makes only true statements. 6. We have established that UTM will never say G is true. So “UTM will never say G is true” is in fact a true statement. So G is true (since G = “UTM will never say G is true”). Although this theorem can be stated and proved in a rigorously mathematical way, what it seems to say is that rational thought can never penetrate to the final ultimate truth… But, paradoxically, to understand Gödel’s proof is to find a sort of liberation. For many logic students, the final breakthrough to full understanding of the Incompleteness Theorem is practically a conversion experience. This is partly a by-product of the potent mystique Gödel’s name carries. But, more profoundly, to understand the essentially labyrinthine nature of the castle is, somehow, to be free of it. “All consistent axiomatic formulations of number theory include undecidable propositions… Gödel showed that provability is a weaker notion than truth, no matter what axiom system is involved… How can you figure out if you are sane? …Once you begin to question your own sanity, you get trapped in an ever-tighter vortex of self-fulfilling prophecies, though the process is by no means inevitable. Everyone knows that the insane interpret the world via their own peculiarly consistent logic; how can you tell if your own logic is “peculiar’ or not, given that you have only your own logic to judge itself? I don’t see any answer. I am reminded of Gödel’s second theorem, which implies that the only versions of formal number theory which assert their own consistency are inconsistent. This entry was posted in Science and Philosophy, Uncategorized. Bookmark the permalink. What is the Largest Number Representing Something Empirical? Was the Tower of Babel a Ziggurat? The “Born Again” Narrative in John 3: An Aramaic Impossibility? Well, No! Can God Make a Stone He Cannot Lift? New 3-D Image …of Jesus?